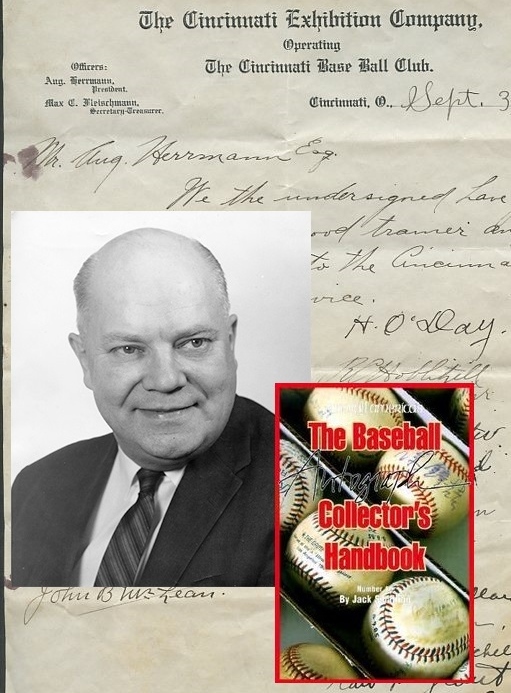 Jack Smalling, author of the "Baseball Autograph Collectors Handbook " (inset), says HOF historian Lee Allen (inset) gifted him two rare letters addressed to August Herrmann. One is signed by newly minted HOFer Hank O'Day and worth upwards of $20,000. When Baseball Hall of Fame historian Lee Allen secured August Herrmann’s entire archive of correspondence from Cincinnati Reds owner Powel Crosley Jr., it was a feather in his cap and a huge addition to the developing baseball library he headed. 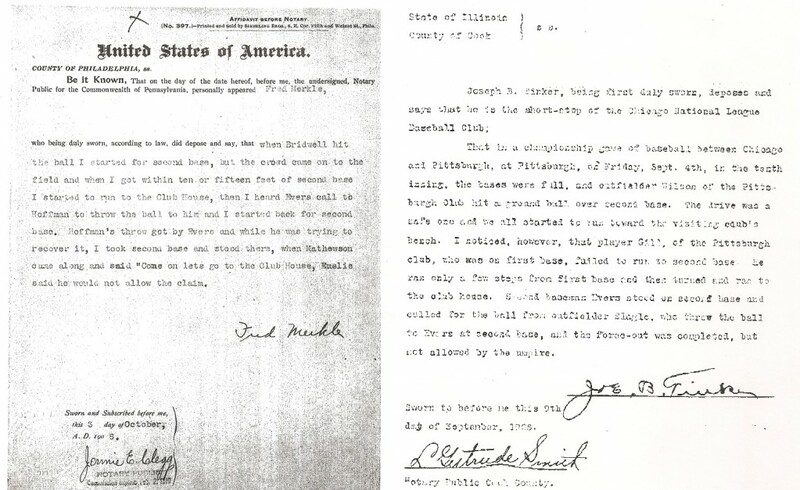 Over the years, similar letters from the Hall archives which were sent by O’Day and others to the league and Herrmann have mysteriously found their way into auctions and the personal collections of autograph collectors obsessed with obtaining the genuine signatures of as many Baseball Hall of Famers as possible. To date, enough evidence has been compiled and presented by Haulsofshame.com to illustrate that the National Baseball Library’s Herrmann Papers archive was the victim of a large scale heist of historic documents in the 1980s at a time when the collection was disorganized and had not yet been microfilmed. Thus, any document addressed to Herrmann appearing for sale is considered a possible stolen item from the Hall’s collection and several have been pulled from sales conducted by Heritage and Robert Edward Auctions while others have been auctioned off by Clean Sweep and Huggins & Scott despite warnings. Adding to the controversy is the fact that the Baseball Hall of Fame itself has failed to claim title or pursue recovery of any of the rare and valuable documents allegedly claiming they cannot determine if they were stolen. That being said, the Hall has also failed to pursue recovery of other stolen photographs which were visually documented as Hall property in photo shoots conducted at the museum in the 1980s. Incident reports alleging the thefts and documenting the sales of stolen property can be found at the Cooperstown Police Department. Back in February two more documents addressed to August Herrmann appeared for sale in what hobby veteran Lew Lipset called his “final auction.” One was a letter from Hall of Famer Miller Huggins regarding his playing for Herrmann’s Reds and the other was a 1921 letter signed by the entire Reds team supporting the team’s hiring of a trainer named George Hoskins. The second document became more notable when the Reds’ manager, ex-umpire Hank O’Day, was elected to the Hall of Fame for induction this summer in Cooperstown. The Huggins letter is estimated to be worth between $5-10,000 and the letter signed by O’Day at least $20,000 considering the scarcity of the newly minted Hall of Famer’s signature. Both letters were removed from Lipset’s auction when this writer pointed out the issues to the auctioneer but remarkably Lipset said his consignor had some interesting information to offer about the provenance of the two extremely valuable letters. The consignor, veteran autograph collector and dealer, Jack Smalling, told him that both letters were given to him as a gift by Hall of Fame historian Lee Allen for research work he’d assisted with. Lipset also said that Smalling told him they were the only two letters given to him by the Hall historian who passed away in 1969. Back when they were given to him the letters had little monetary value, perhaps a few hundred dollars at best. Jack Smalling claims that HOF historian, Lee Allen, gave him these two letters addressed to August Herrmann as a gift for work he'd done for the Hall. One letter is signed by Hank O'Day and the 1921 Reds (left) and the other is signed by HOFer Miller J. Huggins in 1903 (right). But how could Lipset know for sure? In our last report it was revealed that around 1990 Lipset sold several rare documents signed by the 19th century New York Giants that appear to have been stolen from the National Baseball Library and he had no recollection where he acquired them. How could he determine whether these Herrmann letters were legitimately transferred without having answers from Lee Allen? One thing that is for sure, however, is that the two letters given to Smalling originated from the Herrmann Papers archive in Cooperstown and the Heritage Auction lot description makes no mention whatsoever of the provenance of the letters and the story told by Smalling. Chris Ivy of Heritage did not respond to our inquiry for comment. When I was first informed by Lipset that these two documents were being offered in his auction I notified him about the Herrmann Papers provenance issues which I assumed he was already aware of. Lipset said he consulted with a friend who was an attorney who suggested he contact the Baseball Hall of Fame. I also consulted with a prominent baseball historian for his advice and it was suggested that since Lee Allen worked for the Reds before he came to the Hall of Fame it could have been possible that he took possession of these two letters before the entire archive was donated to the Hall by Reds owner Powel Crosley Jr. in 1960. I asked Lipset to confirm with Smalling if he was given the documents at the National Baseball Library or at Allen’s Cooperstown home? Lipset said Smalling responded that the letters were sent to him by mail. Lee Allen (top right) served as the HOF's historian until his death in 1969 and was responsible for the NBL acquiring the August Herrmann papers archive from Reds owner Powell Crosley Jr. in 1960. 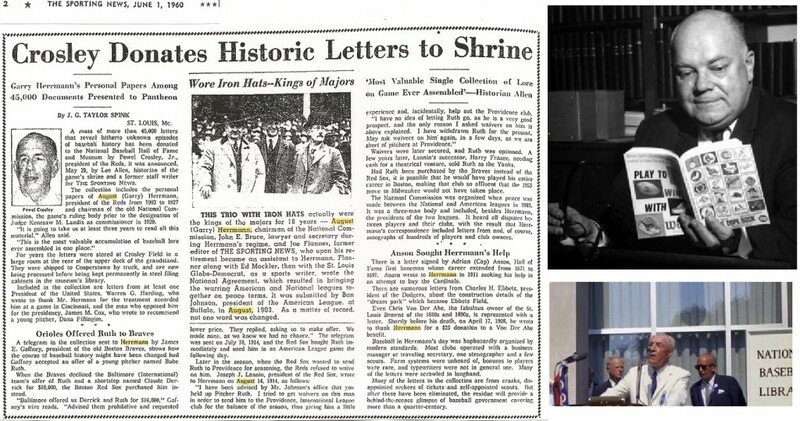 The collection was described in TSN in 1960 (left) and was the backbone of the NBL when Ford Frick dedicated the new library building in 1968 (bottom right). Based upon that information I thought it was still plausible that these two letters could be the only “Herrmann Letters” in private hands which were not wrongfully removed from the Hall of Fame. I even mentioned the O’Day letter to a collector who then asked me to pass along an offer to Smalling via Lipset if the letters were found to be legitimate. Dorothy Seymour Mills says Lee Allen put special documents from the Herrmann Papers archive in a file in his library office. One such document was a 1908 affidavit signed by Fred Merkle (left) with his testimony about the infamous "Merkle Incident" of 1908. The affidavit was from the protested game files and remains at the Hall while other affidavits that should still be part of the collection, like a 1908 affidavit signed by Joe Tinker (right), were sold by Barry Halper at Sotheby's in 1999. Lew Lipset (left) was set to auction the consignments of Jack Smalling (center left) which featured a document signed by newly elected HOFer Hank O'Day (center right). The letters were pulled from Lipset's sale and ended up with Chris Ivy (right) at Heritage Auction Galleries. The letters were pulled from the Lipset auction but have now resurfaced as a consignment from Smalling to Heritage Auctions’ 2013 National Convention Platinum Night Auction. 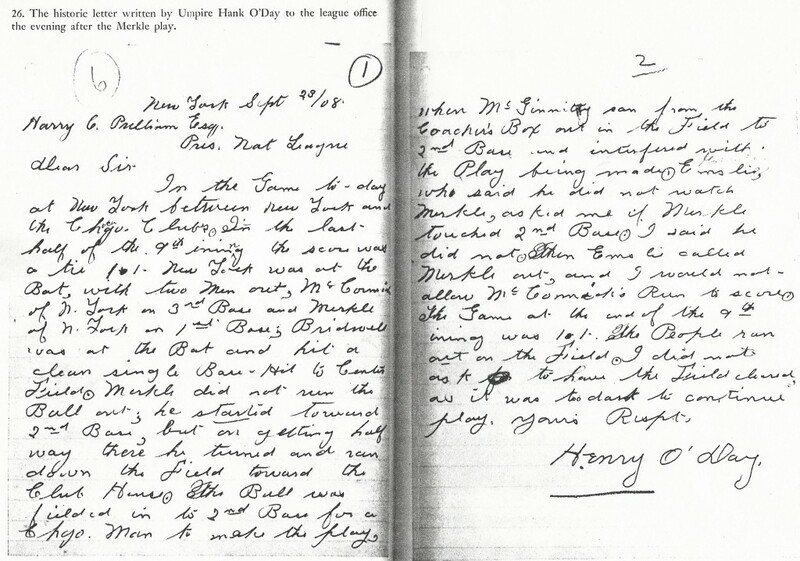 Despite the questions as to whether Allen legitimately gifted the O’Day and Huggins documents to Jack Smalling, they will likely not be scrutinized by officials at the Baseball Hall of Fame who have historically ignored any evidence of thefts from the Herrmann collection and have failed to pursue recovery of property owned by New York State under the Museum’s charter. It is ironic that the Smalling documents have landed at Heritage, an auction house that has already pulled numerous documents from prior sales because of suspicions they were stolen from Cooperstown and also employs Mike Gutierrez as a consignment director despite the fact that he was the prime suspect in a 1980s investigation into stolen documents and photographs from the Hall of Fame. An eyewitness who accompanied Gutierrez on a trip to the National Baseball Library in the late 1980s told the hobby newsletter, The Sweet Spot, that he saw Gutierrez stealing documents from the Herrmann Papers collection. A source tells Haulsofshame.com they have knowledge of Gutierrez directly selling another similar letter from Huggins to Herrmann in a private transaction with a collector. Jack Smalling's status as a hobby pioneer comes primarily for his work compiling lists of former MLB player addresses which collectors used for autograph requests. Smalling placed the top ad in the December, 1970, issue of The Trader Speaks along with "Data Sheet #23 (551-575)" which featured the address of 1919 Black Sox player Charles "Swede" Risberg. 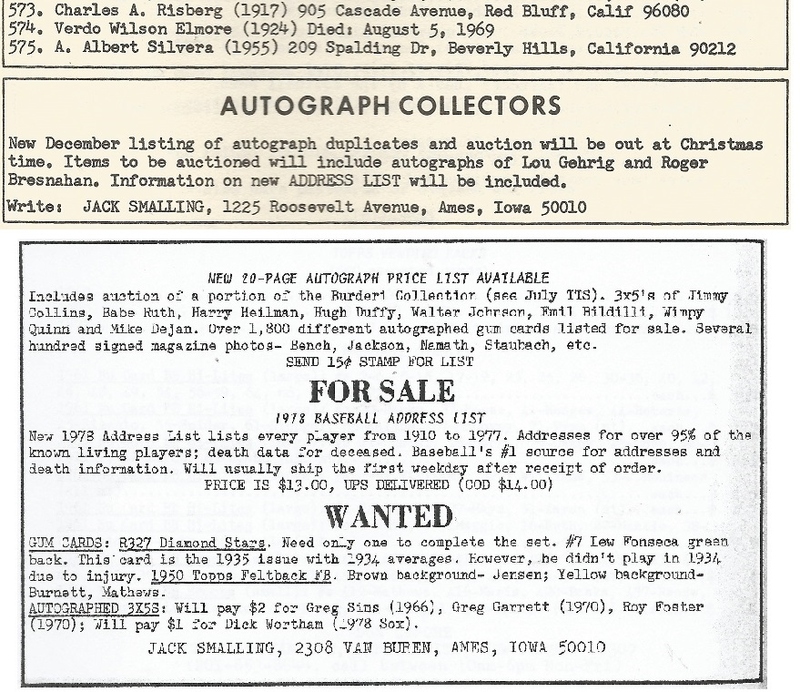 He placed the bottom ad in TTS in 1978 hoping to buy and sell autographs. Smalling is regarded as a trailblazer in the hobby who tracked down and documented the current addresses of former players for autograph hounds and shared his information in columns he wrote for early hobby publications like The Trader Speaks. But Smalling also operated as an autograph collector and dealer and over the decades has amassed a considerable collection of baseball rarities. Lipset says that when Deacon White was elected for induction earlier this year, the Hall reached out to Smalling for an exemplar of White’s autograph. Lipset said Smalling had a White autograph in his possession but Hall officials didn’t realize that they already had a letter written by White which is part of the Herrmann Papers. From his home in Ames, Iowa, Smalling declined to be interviewed today in regard to his selling his “gifts” from Allen at Heritage, but several dealers and hobbyists have expressed their feeling that Smalling is undoubtedly telling the truth about Allen giving him the valuable letters addressed to Herrmann. While every other Herrmann letter appearing for sale at auction has had absolutely no reference to its origin or provenance, it is refreshing to see these two with an actual history dating back to the 1960s, in the same decade Lee Allen secured the Herrmann archive for the Hall. We spoke with one autograph collector who was active in the 1960s and he confirmed that several other very young collectors had helped Allen obtain addresses and information just like Smalling had and that Allen, instead of paying them, gave them new addresses and autographs for their collections. The collector made it clear that he had never heard that a Herrmann letter or other historic documents were ever given in exchange for work. We may never know the actual circumstances under which Lee Allen “gifted” Jack Smalling letters from Herrmann’s archive in exchange for work he had done for the Hall. As someone who knew him personally, Dorothy Seymour Mills felt Allen displayed a sense of ownership over the Herrmann archive and that feeling is echoed in a 1963 letter he wrote to Hall of Fame President Paul Kerr to informally apply for the Hall’s Director position. In the letter Allen made the case that his “wide acquaintance in the world of baseball,” his “personal honesty,” and his dedication in building the library collections, including “obtaining the Herrmann papers,” qualified him for the Director position. Whether Lee Allen gave away the Herrmann letters legitimately or not, one thing is clear. He gave his life to the Hall. SABR has always considered Lee Allen to be a legitimate baseball historian. There is no question that Lee had a real sense of history. He was thrilled to receive and handle the Herrmann Correspondence for the museum. And he was delighted with his new position at the library; it raised him from being a reporter to an archivist. But he did not realize what he was doing when he gave away some of the Hall’s documents to his friend. There was a hole in his understanding of the value of historical documents. They were not his to give away; they were there for historians, including future historians, who would lose access to them if he removed them from the collection. Lee obviously did not understand this aspect of his job, which was to preserve the materials as well as to use them and supervise their use. It looks like the letter has a Ed Grant signature on it as well who was a war veteran killed in WWI. If my memory serves me correct he was the first professional casualty in the war from baseball and died 5 weeks before the peace treaty was signed on Nov. 11, 1918. This signature is rarer than the O’Day but not as valuable because he is not a HOFer. Just to clarify I am talking about the letter that has multiple signatures on the Cincinnati Reds stationary. Having dealt with Mr. Smalling for many years, making modest purchases and participating in auctions, I have found him to be painstakingly accurate and honest. In my opinion, if Mr. Smalling says the letters were given to him, then the letters were given to him, period. Although Smalling declined to be interviewed, I don’t think there is much of an issue as to whether he was being honest about getting the gifts from Allen. I have no reason whatsoever to doubt him and everyone I interviewed shared your sentiments. The issue is whether Lee Allen had any right to give away what appears to be documents donated to the Hall of Fame. The only way he could have had that right is if he acquired them from Powel Crosley Jr. before they were donated. It’s next to impossible to determine this without Allen’s testimony or some supporting evidence that has never been seen. I wanted to ask Smalling if Allen sent him a cover letter with the “gift” of the two Herrmann letters. Or did he just drop them in an envelope with no note? As the author of the only biography of August Garry Herrmann in existence, I am appalled at the continued revelation of the past and present unmitigated pilfering of The Herrmann Papers by common thieves. Forget that Lee Allen may have been munificent in his stewardship of the collection. What’s more important is going forward that Hall of Fame become proactive in protecting this magnificent collection of major league baseball history. It’s apparent that when these thieves bring parts of the Herrmann Papers to auction houses without presenting one thread of documentary evidence the burden of establishing proof for legitimate ownership lies on the receiver. As it looks like the field is wide open to speculation by auction houses, the solution seems to lie in the need for a legislative fix using the pawnshop business as a model. Maybe Mr Smalling could take his windfall for selling his gifts from Lee Allen and donate them to SABR? Isn’t there a Lee Allen chapter? Mike Mango, good catch! That is indeed the signature of Eddie Grant, who played for the Phillies, Reds, and New York Giants. Grant was a genuine war hero who gave his life trying to save his friend in the Argonne Forest during the last great American offensive of World War I. A monument featuring an inscribed plaque honoring his sacrifice and courage was erected in the outfield of the Polo Grounds, and each Memorial Day thereafter a ceremony was held during which a wreath was laid on the monument to honor Grant’s valor. Sadly, the plaque disappeared following the New York Giants’ last game there in September of 1957 and has never been found. But Giants fans remember Captain Grant, and so do New Yorkers: a stretch of highway up in the Bronx still bears his name, as do two area American Legion posts. His signature may not be worth as much as a Hall of Famer’s in the baseball memorabilia market, but to those of us who cherish all things Giants, it signifies something far more precious than mere monetary value. As a veteran in this field in selling and buying autographs since the 1960’s I hope I can shed a little light on the issue of autograph values in the last 50 years. From the New England market in approximately 1970 the unwritten rule was you sold a living 3 x 5 card for 15 cents and sold a deceased autograph for $1 unless it was a Gehrig or Ruth, etc. I bought a Eddie Cicotte in 1972 for $1 as this is what the market was commanding. In the mid 1970’s I bought a 1932 team sheet with 11 signatures that included Ruth, Gehrig, and Lazzeri for $100. In 1980 a decade of inflation took it’s toll and I was able to sell a Ty Cobb 3 x 5 for $20 as this is what it was worth. As veteran autograph dealers read this they will be able to tell their own stories of buying and selling in the 60’s and 70’s. It was a hobby for the fun of it and for sure not for the money it brings today. I can assure you that in the 1960’s these autographs were worth close to nothing and if Jack Smalling took these 2 autographs or letters or whatever the issue is here for compensation for work he did for the Hall of Fame and did not get paid for his work in the form of cash then this story should be about how much the Hall is going to send him today for being short changed on the transaction he did 45 years ago. I have known Jack for 40 years and participated in his auctions which were silent auctions. Every bid I placed that topped all other bids was reduced to the winning number just slightly over the second highest bid. Never did I pay the amount that I submitted. Jack is as honest as it gets and I have many years of experience to vouch for him. There’s more I could shed on these situations as my memory through time is crisp but I think I have said enough and you all can get the idea. Mike- I don’t think Smalling’s story is being questioned but the fact that the auction house makes no mention of the origin of the letters raises some questions and Jack’s reluctance to comment adds to that. The issue is whether Lee Allen had the right or authority to give these documents away. Quite the bargains back then. Thanks to all, I’ll be interested in the updates. Even if Lee Allen gifted the letters to Jack Smalling, the correct thing would be for Jack Smalling to give the letters to the HOF, especially given that there is no doubt that these letters at one time belonged to the Herrmann collection. This would set a precedent for future auctions that continue to march out ‘allegedly’ stolen items. Primarily, it solves the potential onslaught of ‘Hey, so-and-so gave this to me’ excuses that will follow. There are numerous secondary and beyond impacts as well. 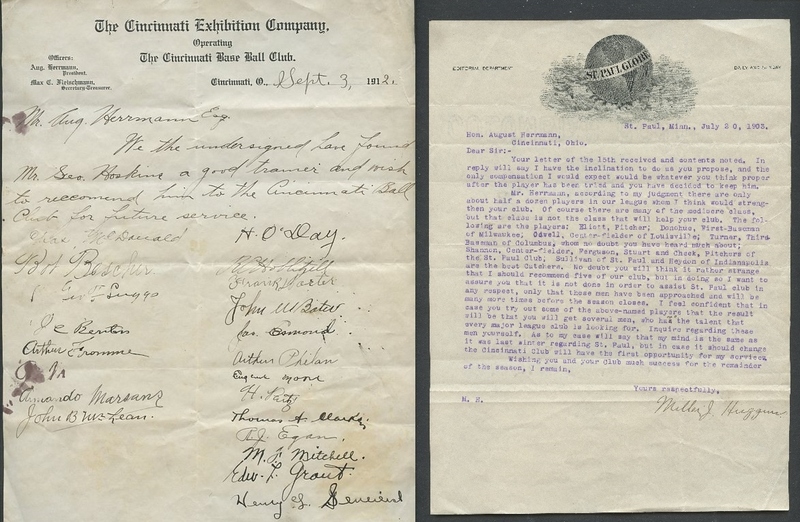 Heritage sold the Reds 1912 letter for $16,730.